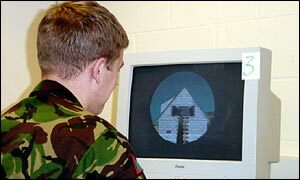 The British Army is using a specially developed version of the celebrated computer game Half-Life to train its troops. With the first-person shoot-em-up soldiers can try out new weapons and new tactics without encountering real bullets and bombs. The Ministry of Defence hopes the system may help reinforce some of the lessons learned on more traditional training exercises. Like the popular modification, or mod, of Half-Life known as Counterstrike, the army version allows up to eight soldiers to go into virtual combat at any one time. The troops work as a unit, moving about a simulated environment to track down and confront an enemy. 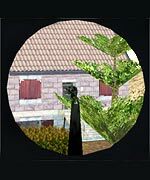 Similarly, a typical Counterstrike game pits two teams of four players against each other, with one side playing terrorists and the others the counter-insurgent troops. Using a mouse and keyboard, the soldiers can fire their guns, throw grenades and even plant plastic explosives. According to Major Bruce Pennell, of the army's Logistics Corps, the system has worked well so far. "One of the difficult things is how to measure the level of immersion," he said. "It's clear to us - particularly me as a military observer - that these guys are really engaged in what they are doing; it is not just a game played across a keyboard and a mouse. They want to succeed just as they want to in real training." He added: "Obviously, being killed in the virtual world isn't quite so serious. 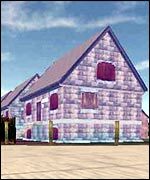 We don't have virtual officers writing letters to the dead soldiers' virtual parents, but we'd hope the games are authentic enough to reinforce good teaching." Chris Morris, from the technology firm QinetiQ, which is helping to develop the computer system, said some of the fantasy found in commercial games has had to be removed to drive home the consequences of making a mistake in real combat. "In a standard shoot-em-up game, every time you get shot your health goes down by a few percent," he said. "The more that happens, the less healthy you become. Here, of course, one bullet and you're out of the game." The MoD is currently evaluating the system. One possible application would be to allow troops to practise their missions before they went on them for real. But, Major Pennell conceded, there were potential dangers in doing this. "You would have to make sure the environment you are modelling is as accurate as possible. What you don't want to happen is for a soldier in a real situation to run around a corner to find the door that existed in the virtual environment, only to find in the real world the door is not there."